MENDOZA – When you excavate 1,000 lorries worth of mountainous rocks in order to plant vineyards, the only logical outcome for all that surplus material – if your name is Sebastián Zuccardi – is to build a winery with it. 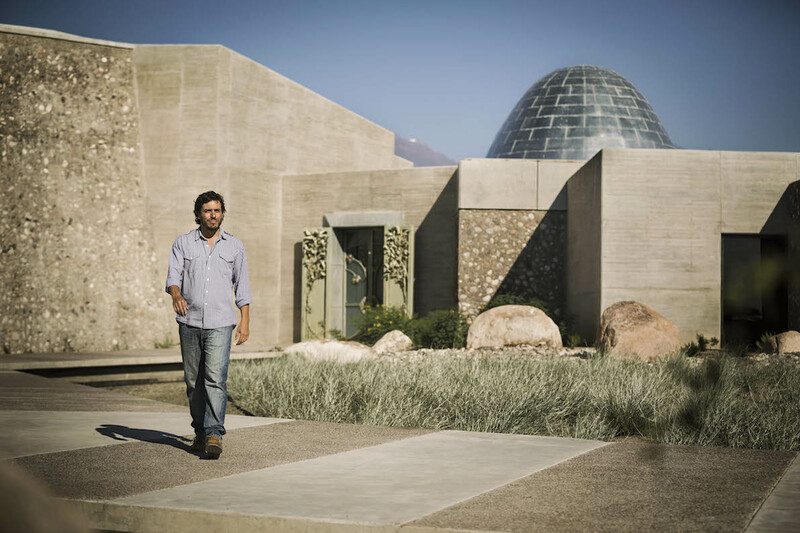 Sebastián Zuccardi at Bodega Zuccardi Valle de Uco. And from Wednesday, Bodega Zuccardi Valle de Uco throws open its doors to its second winery affectionately known as Piedra Infinita, a labour of love that was inadvertently conceived around nine years ago by the young agronomist and winemaker, the third generation to work in the family business. A winery that has most recently been producing mass line wines such as Santa Julia, this new model is a shift for the Maipú wine-making powerhouse, as it concentrates on sourcing grapes from Uco Valley at its Paraje Altamira estate. Some 240 concrete amphorae form the bulk of Zuccardi Valle de Uco’s cellar, each varying between 2,000 and 10,000 litres, a significant step away from depending on high-cost oak. The winery in fact patented that particular shape for two years so as to ensure exclusivity for their wines. Naturally, there’s logic behind this epic scale: high-end lines such as Tito, Emma, Concreto, Zeta, Polígonos del Valle de Uco, Aluvional and Finca will now be produced here, as the grapes – Malbec, Cabernet Sauvignon, Ancellotta and Bonarda – are grown in these alluvial, highly stony soils and will complete the circle of origin, fermenting and aging in in these concrete vats. And of course the original Maipú base, the winery’s home for more than 50 years, certainly won’t be made redundant. It will be renamed Bodega Santa Julia, exclusively turning its hand to that brand while continuing to run Casa del Visitante restaurant and host the olive oil production plant. Epic panorama from Bodega Zuccardi Valle de Uco. To launch this brand-new project that cost around US$15 million, the Zuccardi family – CEO José Alberto, Sebastián plus his siblings, tourism head Julia and olive oil producer Miguel, as well as the trio’s mother commercial director Ana Amitrano – threw an epic party for 400 of their closest friends last Wednesday. From this Wednesday Piedra Infinita Cocina, led by Casa del Visitante’s chef Matías Aldasoro, will start opening for visitors, focusing on regionally sourced ingredients, while private tastings and guided tours of the architecturally impressive winery will also kick off (reservations necessary). Thanks to the familiar team effort already applied to the Zuccardi empire, this latest addition is set to become a firm, if off-the-beaten-track, fixture to Uco Valley’s attractions, a contemporary offering set along the dirt tracks of Altamira. A splendid and unique view, world-class wine (I love Aluvional Paraje Altamira 2013 and Emma Bonarda Valle de Uco 2013) and fine dining from a tried-and-tested, family-run business: you can’t ask for much more from Bodega Zuccardi Valle de Uco.